Tasmanian Blackwood - Acacia Melanoxylon. Tasmanian Blackwood is one of the most highly valued tonewoods. A distant cousin of Hawiian Koa. 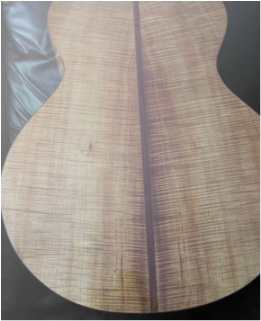 Many luthiers consider Tasmanian Blackwood to have greater density and a better tap tone than Koa. Blackwood produces a beautiful lustre, fiddleback and quilted available on a small scale, the variety of tonings range from light golden browns to deep browns, sometimes a reddish tint and occasionally showing black streaks. Stable and easy to work, acoustically it has warm woody tones similar to that of Mahogany and the brightness of Rosewood. Blackwood is an all around excellent tonewood well suited for various playing styles. Blackwood also makes an excellent Soundboard.